The workshop begins Tuesday, July 3 at 9:30 am. We will meet at Delta Community Music School, 4705 Arthur Drive, in Ladner. There is parking lot is across the street next to the lawn bowling green. Parents of younger students, please plan to stick around for the first 15 minutes or so. Drummers, bass players, and guitarists are requested to bring their own amplifiers and drum kits. This equipment can be left at the workshop for the duration. The Music School is locked and has an alarm. All students should bring a lunch, a snack or two and a water bottle. There is very limited time for students to purchase a lunch from the mall as lunch time is also concert time with our guest artists and faculty and all students are required to attend the these concerts. Food is important for an event of this kind. We strongly suggest that you bring something healthy that will provide you with the energy you will need for a very full day of music making. PLEASE NOTE – we have some students with severe nut allergies this year. In consideration of their health and well being, we ask that you please do not bring foods which contain nuts. 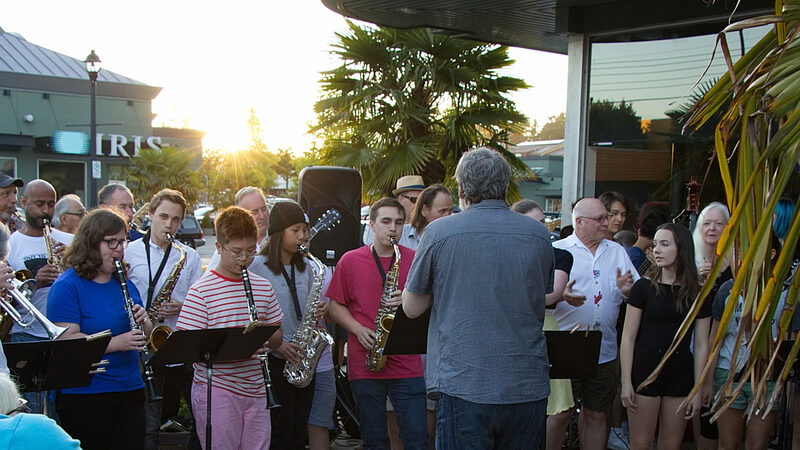 Wednesday July 4 Advanced Student Concert at Diefenbaker Park 6:30-9:00pm Some of our advanced students will be performing at Diefenbaker Park in Tsawwassen. Bring some food and a lawn chair and enjoy a summer evening with great music. Attendance is not required, but encouraged. Thursday July 5 from 7-9pm Jam Session at Petra’s Arts Kafe in Tsawwassen. This is open to workshop participants and to anyone in the community who plays jazz. This is a really fun part of the workshop and always a highlight for students and families. If you don’t know what a jam session is or how it works, DON”T WORRY the workshop will prepare you for it! Friday July 6 Faculty Septet Concert 7:30pm. All Saints Anglican Church. Tickets $10 Students receive free admission to this event and are expected to attend as part of the learning process. The evening concert is an important and a required part of the program for workshop participants. We could use some help selling tickets to this concerts. We can give you one free ticket for every three that you sell. Tickets are only $10. Saturday July 7 Final Student Concert 12:00-3:00pm at Delta Hospital Grounds. Parents, spouses, family and friends are all welcome to this concert or any of the noon hour shows. Admission to noon shows and final student concert is FREE. Rehearsals on Saturday will run at the Community Centre as usual from 9:30-11 and then we will be heading over to the hospital grounds for our final performance. We will need help transporting students between the Community Centre and Delta Hospital, so if you can help us drive on that day please let us know. If you have received scholarship funding to attend the camp you will be notified before the start of the workshop. You will be asked to write a letter thanking our various sponsors. We will provide the mailing address and other information for this letter. Please do not discuss scholarship funding with other students.